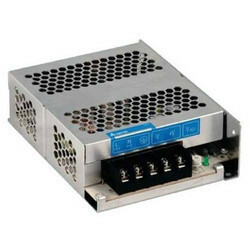 We are leading trader of Industrial Power Supplies. In order to attain the maximum satisfaction of our esteemed clients, we are engaged in offering efficient Panel Mounting Power Supplies. These supplies are extensively used in power distribution. Under the direction of skilful professionals, these supplies are engineered using quality approved components as well as modern techniques at vendors’ end. We assure for the flawless nature, the provided supplies are rigorously tested on numerous practical parameters by our quality experts.